From this newspaper article, we realized that it's the result of last year's Phailin Cyclone attack where Gopalpur and its surrounding areas in Odisha, including the Temple-City, Bhubaneswar & the Silk-City, Berhampur, were badly hit. Cyclone Phailin, a Category 5 Cyclone, made its presence felt last year from October 4th to 14th, 2013. 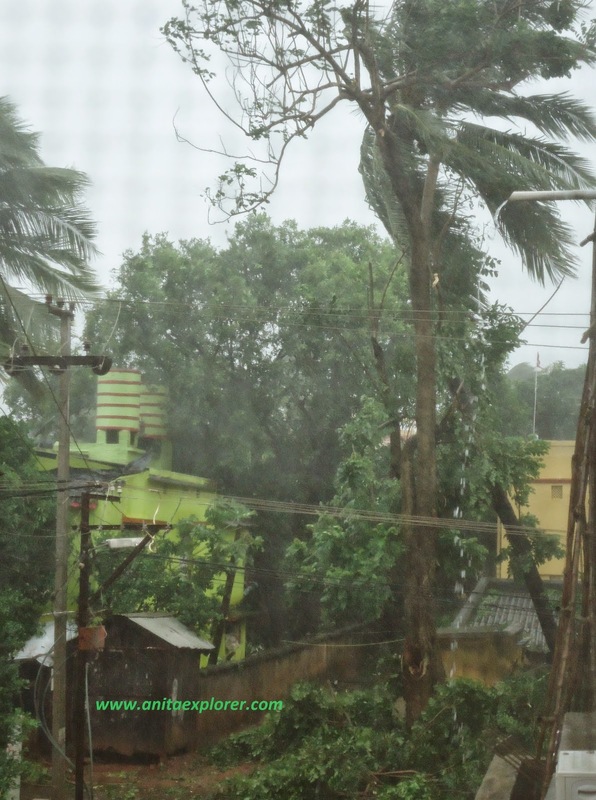 The landfall was near Gopalpur, Odisha with the highest wind being 260 km/h. In Odisha, 11.5 Lakh people were evacuated, while in Andhra 1.3 Lakh people were evacuated. In contrast, the recent Cyclone HudHud is a Category 4 Cyclone that has emerged from October 7th 2014 onwards with winds about 175 km/h. In Odisha, 1.6 Lakh people have been evacuated, while in Andhra 5 Lakh people have been evacuated. Last year's memories are still fresh in my mind. 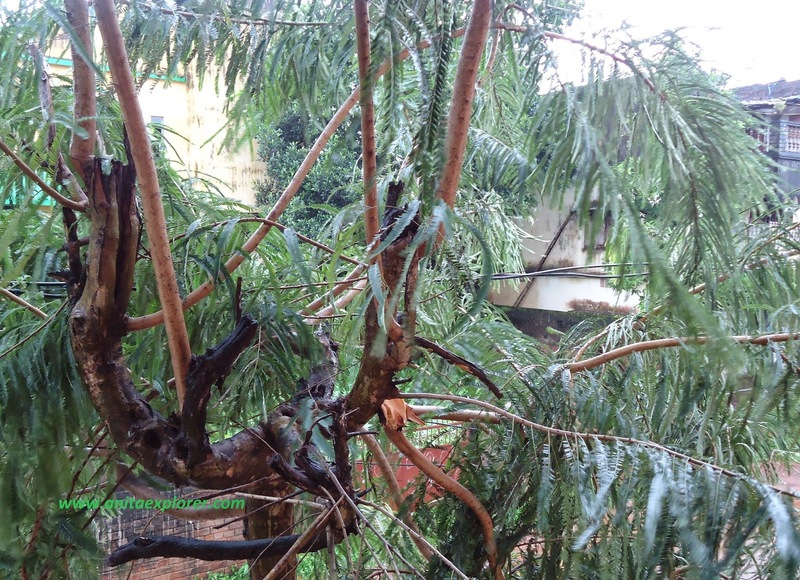 Bhubaneswar, the capital city of Odisha, was also ravaged by the strong winds and the heavy rains. Notice the fallen branches of trees. Cyclone Phailin badly affected Gopalpur and Berhampur. My Grandfather's home & Godowns were severely affected. 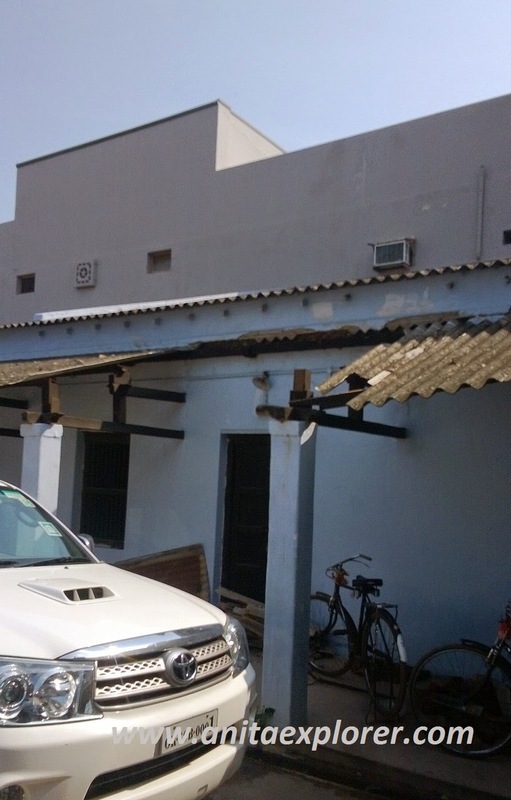 Some roofs had been blown away and a boundary wall had collapsed. As we observe the anniversary of Cyclone Phailin, it is notable to me as it is also the anniversary of my first Top Post on IndiBlogger- SOUND EXPRESSIONS. While Cyclone Phailin raged outside, in candlelight, I had written a love-story set in Gopalpur amidst the Cyclone. It was BlogAdda's WOW topic in which we had to use expressions of sound. There was no electricity and no battery-charge in my cellphone or laptop. The deadline for the post was Sunday midnight. But, as electricity was restored only the next day, I quickly recharged my laptop and typed out my love-story to share with BlogAdda & IndiBlogger. Nice that BlogAdda considered my post and I earned another WOW badge. Also, I posted on IndiBlogger, but unlike the usual times, I could not Vote for my friends/network posts there as there was no electricity again! When finally we had electricity and I logged on, imagine my surprise to find my post for the first time on IndiBlogger's HomePage! Cyclone Phailin had gifted me something to cheer about! This time we are lucky that the cyclone has decided to come with a lesser magnitude. I still remember the agony some of our colleagues have gone through last year the same time,when their family was stuck in the cyclone. Wish we could harness the energy of Cyclones & render them weak. May we have hope & optimism. All sorts of technology leaves us helpless! We are all at nature's mercy, how much ever advanced we be! This is when we realize that how advanced we have become in this world, we are still very small in front of the mother nature. 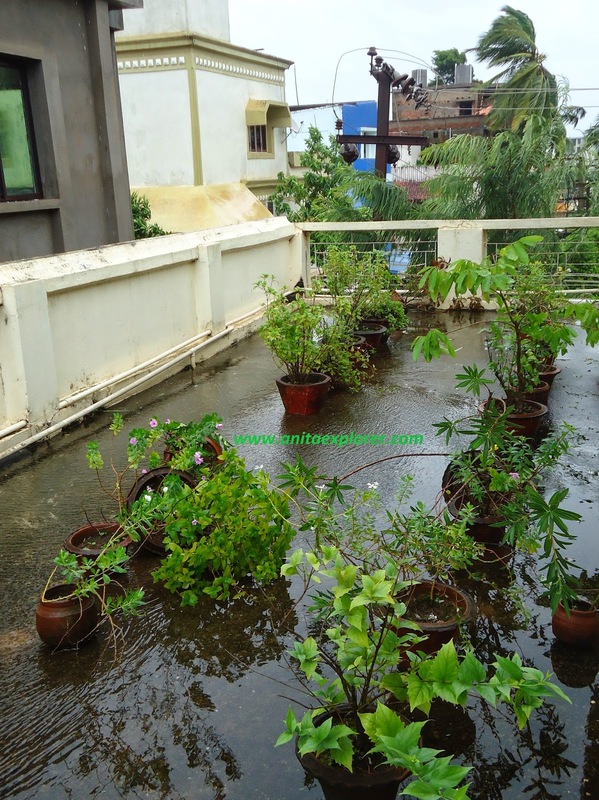 Cyclone is too frightening and I have known the impact when cyclone Thane hit Puducherry a year back .... Yes, nature is too deep and vast for the understanding of human mind however intelligent he might be. Thanks for sharing your experience, Uma. Hope we are all safe from such calamities. So sad... Glad that people are warned well in advance and evacuated... Liked the way you took everything positively :) Afterall, being optimistic is what gives us strength! may we all be optimistic and tide over everything.